It should be emphasized that the success of open urethroplasty is very dependent on the surgical technique and the expertise of the surgeon. When urethral surgery is not properly performed, early recurrence of the stricture is a very common complication. Over 90% of our patients are referred to the Center for Reconstructive Urology by their local Urologists. Even though they have privileges to perform urethral reconstruction, they refer these patients to our Center because they want their patients to have a successful outcome and believe this is best achieved by a fellowship trained sub-specialist whose practice is exclusively devoted to male urethral-genital reconstructive surgery. In some cases, patients referred by their local Urologists to our institution out of their insurance network have been “re-directed” by their insurance company to a different in-network Urologist in their network willing to attempt the repair, contrary to the wishes of the referring Urologist. It is reasonable for patients to be re-directed when the motivation is to find a doctor more qualified. However, it has been our experience that these decisions are generally made by non-Urologists employed by insurance companies seeking to find a physician and institution contracted at the lowest rate who will accept the patients. In every case where patients have been re-directed, it has not been to a Urologist more qualified based on training and were always re-directed to doctors who only performs male urethral and genital reconstructive surgery part-time. Unfortunately, in many cases, these patients had failed outcomes with disastrous results, and then presented to us (this time with insurance authorization) for complex re-do surgery. One example is a young man who at age 21 was involved in a motor vehicle accident and suffered a pelvic fracture and a complete urethral disruption. He was initially managed with a suprapubic tube (a catheter that directly enters the bladder through the abdomen to drain the urine into a collection bag) given that it was impossible for him to urinate. In general, we perform definitive urethral reconstruction 3 months after the injury and never had an immediate technical failure (70+ consecutive patients over the past 12 years). He was referred to Dr. Gelman, and then re-directed by his managed care insurance to another major university teaching hospital within his network and advised to have this complex surgery at UC, Irvine by Dr. Gelman. He was instead again re-directed to an in-network Urologist willing to perform the surgery. Subsequent to the surgery, within 24 hours of urethral catheter removal, the patient was unable to urinate. Ultimately, after a 3 year delay as the patient continued to require a suprapubic tube, he was authorized to receive his care by Dr. Gelman. 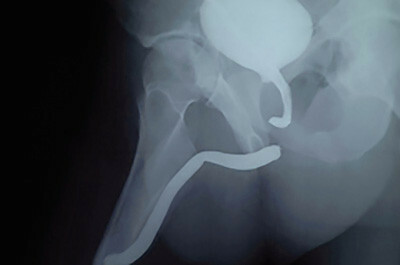 The urethral imaging performed revealed a 2 cm total obliteration of the urethra as a complication of his initial surgery. He then underwent a successful re-do urethral reconstruction at UC, Irvine. 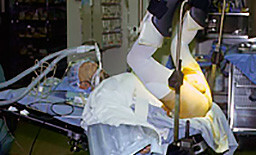 The patient underwent a successful reconstruction and is without recurrence. Urethroscopy was performed 5 years after surgery. The patient continues to have a wide open urethra. Although stricture recurrence is always a possibility, even when the surgery is performed by a qualified experienced specialist, recurrences more commonly occur when surgery is performed by urologists not exclusively specialized in male urethral and penile reconstructive surgery. When the surgery is not properly performed, failure is an expected outcome. More serious complications include damage that prevents foot or other leg movement and compartment syndrome. When there is prolonged compression of the calves, there can be a build up of pressure in a closed space within the lower leg called compartment syndrome. This is a surgical emergency and is treated by making long deep incisions in the legs to relieve the pressure and these incisions are called fasciotomies. To date no patient who received care at the Center for Reconstructive Urology has experienced these complications. However, we have seen patients who reported a history of prior urethral surgery complicated by compartment syndrome or nerve damage from positioning that required them to use a walker or a wheelchair at the time of discharge. We believe that the use of special equipment along with careful attention to detail during positioning reduces the risk of these complications and has contributed to our success with lithotomy positioning. 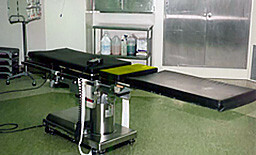 At UC, Irvine Medical Center, all urethral reconstructive surgeries are performed using a Custom Skytron 6000 OR Table with a Jordan modification (as shown in yellow) to allow pelvic tilt. This table was designed specifically for urethral reconstructive surgery. As the pelvic portion tilts, the legs are proportionally raised preventing leg or hip flexion as the pelvis is supported. Our stirrups were modified by the manufacturer according to Dr. Gelman’s specification to allow additional extension, further preventing excessive hip or knee flexion. There is no pressure placed on the calves. Great care is taken to prevent pressure points. We also make every effort to minimize the time a patient is in this position. For example, if a graft from inside the cheek (buccal mucosa) is required, this graft is harvested with the patient supine (flat) before the patient is placed in the lithotomy position. There are many potential complications of urethral reconstructive surgery such as bleeding, infection, wound breakdown, tightness with erections (generally temporary), dribbling, and other complications. All surgery is associated with risk. However, when urethral surgery is properly performed, these risks are very low and blood loss is generally minimal. 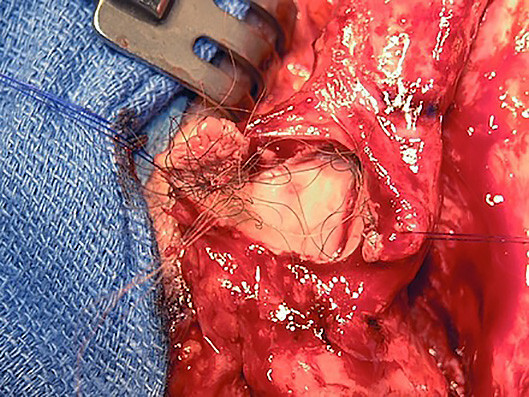 In general, the risks of not treating a stricture are far greater than the risks of repair.